Facebook has always been about helping people make connections. We started with helping people connect with their friends, and over time we expanded this model to mirror more of the connections you make in your life-including organizations and interests that may not be people. We developed Pages, for example, so you could connect to your favorite celebrities, musicians and businesses on Facebook. All of these say something about who you are and the things you care about. 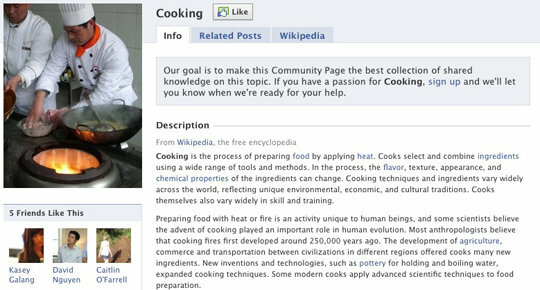 On each Community Page, you'll be able to learn more about a topic or an experience-whether it's cooking or learning a new language-and see what your friends and others in the Facebook community are saying about this topic. Community Pages are still in beta, but our long-term goal is to make them the best collection of shared knowledge on a topic. We're starting by showing Wikipedia information, but we're also looking for people who are passionate about any of these topics to sign up to contribute to the Page. We'll let you know when we're ready for your help. We hope Community Pages and your improved profile make it easier for you to learn more about your friends and to express yourself.